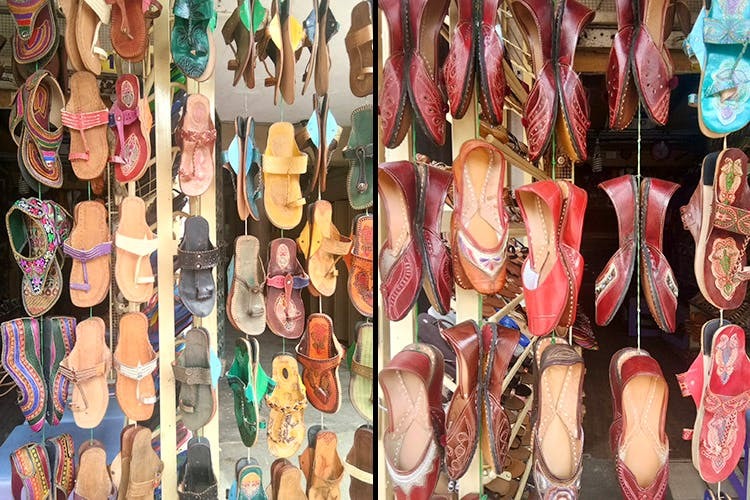 Looking to brighten up your shoe rack with colourful Kolhapuri chappals and juttis? Head straight to Kolhapuri’s, located at Patrick’s Complex. Prices start at a mere INR 350. Brigade Road is a budget shopper’s paradise and if you are on the lookout for the real deal juttis, you’ve come to the right place. Kolhapuri’s (their spelling, not ours) has been a favourite with old timers and is part of Patrick’s Complex, that’s at one end of Brigade Road. It’s especially perfect if you are looking for good, old-fashioned juttis and chappals. The small store has on display colourful, floral chappals (INR 350) with just a few details. They’ll work well when you want to sport a casual look with an ethnic touch. They also have the one with vibrant thread and mirror work that can jazz up any plain outfit. These come at about INR 390. Of course, you can always bargain for a better price. They also have the classic variety of juttis. The more sturdier ones with deep maroon exteriors. These come with simple embellishments and are priced at INR 450. The men needn’t feel ignored as well. The shop does stock a few traditional designs — from the plain chappals to slip one with intricate weaving INR 500 onwards.